Friday April 29th 1881 Mary was here today we sewed till nearly seven oclock. I then went over town to go to the theater with John and Hatt. At last we heard Joe Jefferson in Rip Van Winkle I was well pleased with it. Rob got home tonight at six oclock. 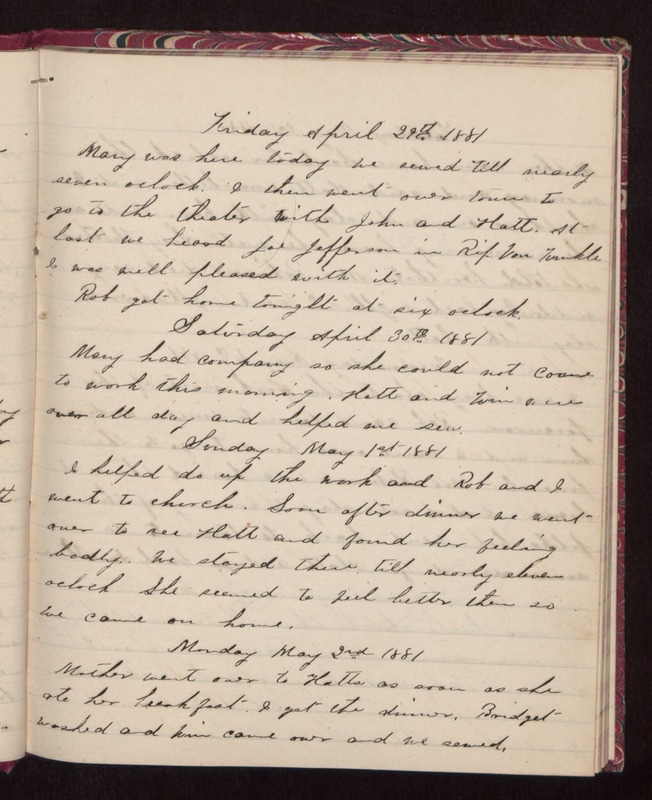 Saturday April 30th 1881 Mary had company so she could not come to work this morning. Hatt and Win were over all day and helped me sew. Sunday May 1st 1881 I helped do up the work and Rob and I went to church. Soon after dinner we went over to see Hatt and found her feeling badly. We stayed there till nearly eleven oclock She seemed to feel better then so we came on home. Monday May 2nd 1881 Mother went over to Hatts as soon as she ate her breakfast. I got the dinner. Bridget washed and Win came over and we sewed.